Another way to look at it is to say that it is a snapshot view of how successful you have been at meeting your customer’s needs and expectations at any given point in time. SPI’s show a total score as either a percentage or raw number for the period measured. They can be created in many formats going from very simply to comprehensive reports that are incredibly detailed. For instance,a FMCG company may create a SPI report that shows a 98% SPI indicating that 98% of all orders were processed, fulfilled, and received within the customer’s expectations. Likewise a Financial institution may have a score of 4 out of 5 for a particular month for exceeding four of its five most important customer service interactions within the customers’ expectations. Why are SPI’s so important? A properly created SPI will give incredible insight into your business capabilities from a customer’s perspective. It will enable you to understand where opportunities lie to improve either your peoples skills, your processes, your products or your fulfilment services within the business to make the experience your customers have when transacting with your company even better. It will also provide your whole business with information on the success and the challenges that the business may have. SPI’s can also be great tools to lend support for business case initiatives, change re-engineering, and process improvements within the business. All SPI’s have a number of attributes that are included to be able to make up the final score/ranking for the period measured. There is no general rule of thumb as to what should be included in an SPI but the thing to remember is that the attributes must include those that measure occurnaces from the customer’s perspective. For instance if you were a call centre environment that had large spikes of Inbound traffic volumes then you would include “Average wait time” as an SPI metric because it records from the customer’s perspective how long they had to potentially wait before speaking to a live operator. How often should SPI’s be produced? Once again this is dependent upon the complexity of the report, the attributes that are being measured and the time periods reported upon. Most businesses produce full summary SPI’s on a monthly basis with individual reports being generated on either a daily or weekly basis. Best practice organisations have built SPI reporting into their daily operations. Rather than waiting till month or period end to understand the outcomes and then react to any issues/opportunities, these companies have set themselves up to proactively manage opportunities/issues to continually increase satisfaction results throughout the measurement period! Who should receive copies of SPI’s? Every person that has any ability to be able to influence the results should receive a copy of the SPI report, from the CEO to front line staff. One company where I worked were masters at producing and using SPI’s within their business. Every month the reports were produced and all of the staff received appropriate copies. It was amazing to sit back and see the reactions that resulted as the reports were digested by the staff. People were genuinely excited about getting the report, understood and took responsibility for the results. Where tabled results were less than expected, people swung into action to ensure the next month’s outcomes would be better! A salutatory story in regards t0 the important of SPIs can be taken from Economics lecturer Professor Hodges who first introduced me to the concept and power of SPI’s. Entering my first lecture with him he diverted the class’s attention to a large piece of cardboard on the wall. 28 of those 30 pictures were placed above a red line on the board and the other 2 were placed below the line. He then went onto explain about SPI’s and how those companies that embrace and use that tool as well as closed loop reporting and continuous process improvement will be the most successful companies around in any economic community, I agree! So in a nut shell this tool can empower people, ensure responsibility, identify opportunities, realise results and look at your business operations from your customer’s perspective. Thanks for sharing, Adam! Excellent post. Every business should invest in acquiring the SPI report. When businesses choose to outsource call center services, the SPI is a great way to see how well the call center is doing with keeping customer’s happy, which also reflects how well the business itself is doing after outsourcing. 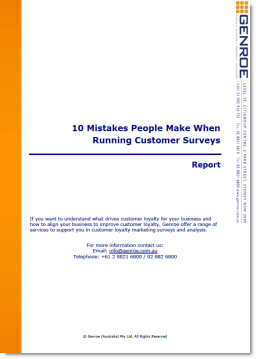 Eventually, this report will be able to save a business from going six feet under.